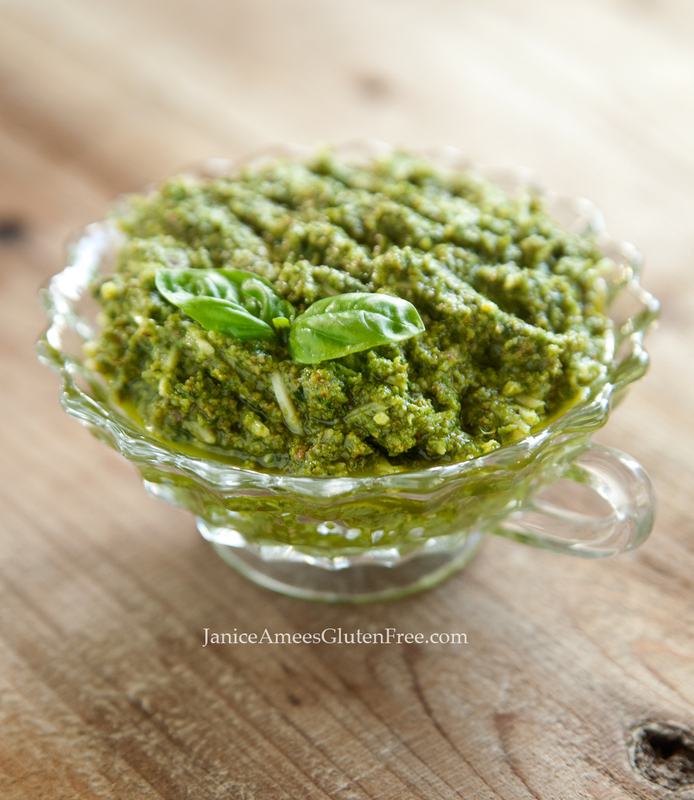 You are here: Home / Recipes / Pesto Pasta (Low-Carb & Gluten-Free)! My little garden has already begun yielding zucchini, which means my spiral maker has been getting a real workout. We really enjoy the perfect low-carb noodles it makes. They’ve been so sweet and tender (without any bitterness); I haven’t felt the need to peel them first. They can be used just as you would your regular gluten free spaghetti or angel hair pasta. 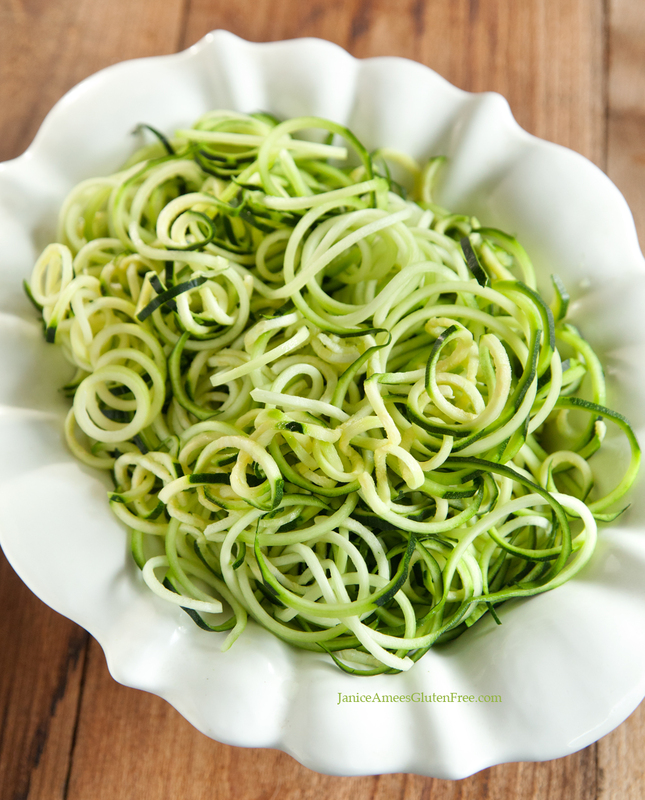 I always make more zucchini noodles than I think I’ll need as they cook down quite a bit. I use toasted almonds in mine, though pine nuts are certainly the more traditional choice. They’re just a bit more expensive. Walnuts can also be used. I have even heard of people with nut allergies, who can tolerate sunflower seeds, using those. 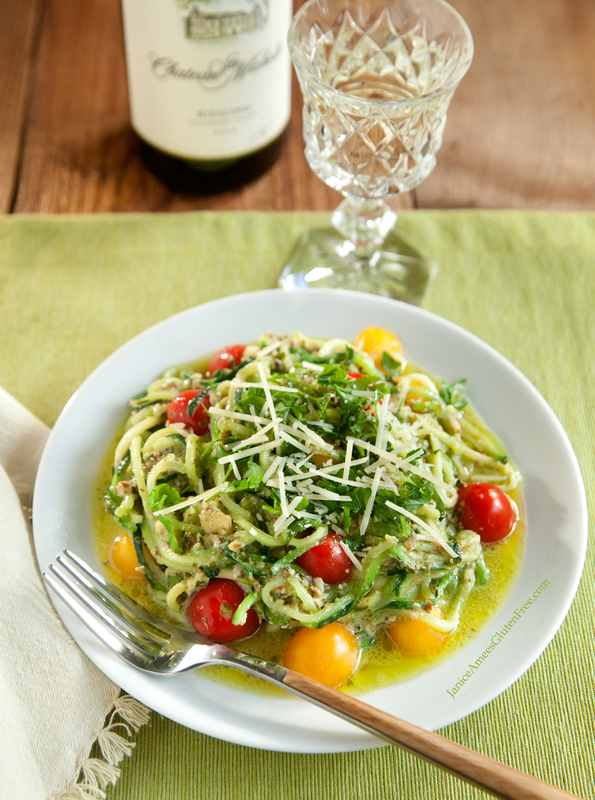 Whichever way you choose to go, toasting them for a few minutes adds another layer of flavor to your pesto. To toast the almonds: In a dry skillet, heat the almonds, stirring them over a medium heat. When they turn a golden brown they’re ready. In a blender or food processor add the fresh basil leaves, olive oil, garlic and toasted almonds. Grind or chop together until the nuts are tiny bits. If you want a thinner pesto, add a little more olive oil. Squeeze a bit of lemon and add the cheese, then pulse. Add a bit of salt & pepper. Taste and adjust the seasonings as you like them. Cover and refrigerate. Will keep for approximately 5 – 7 days. If frozen, it will keep for 3 – 4 months. Of course, you can always buy your pesto already made, which makes everything go just that much faster. But I’ll leave that up to you. All you need to do is saute the “noodles” in a skillet with a little olive oil and/or melted butter. And even though the pesto sauce has garlic, sometimes I add a bit more. Or if you don’t have any fresh garlic, you can use garlic powder or garlic salt. Add the pesto and toss them about in the skillet until they’re well coated. Cook until they’re the way you like them. It takes just a few short minutes. Be careful not to overcook them or they’ll be mushy. I like to toss in a few tomatoes, but that’s entirely up to you. Add a little salt (unless you’ve used garlic salt) and pepper to taste. Sometimes I squeeze a bit of fresh lemon for a more lemony flavor. Then plate the noodles and sprinkle with a little fresh chopped parsley and Parmesan cheese, and voila! A delicious summer recipe that can be ready in just a matter of minutes!